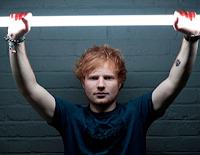 Ed Sheeran scored his first number one on the Official Singles Chart in the United Kingdom yesterday (June 8th) with "Sing." The track, taken from the singer/songwriter's upcoming album X (out June 23rd), sold 124,000 copies in the last seven days. An interview with Ed discussing his first UK number single can be viewed below.